with a finger – use a pencil or similar narrow object to poke through the Programming Button access hole. For most vehicles, the receiver is located underneath either the driver or passenger front seats. On others it is behind the driver’s dash. 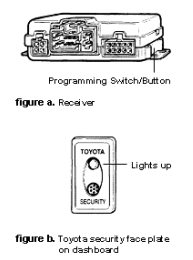 In the case of some Camry’s, the receiver can be accessed by gently prying out the black faceplate behind the mirror control switch. The black faceplate is approx. 5 inches wide by 3 inches tall. (Either of these 2 button can be programmed to the system. The other button can be programmed to operate a second Toyota vehicle with the same system).